This article is regularly updated particularly the imports and Grand Champions - last update June 2018. The first evidence of Chinese Crested Dogs in Australia is found in the 1892 Victorian Poultry and Dog Exhibition catalogue. There were six dogs owned by J Matthews entered in the exhibition, four were for competition only and the other two were in a different class where they were also available for sale. The section in which they were entered was "any other variety or extra stock". J Matthews was asking 100 guineas for each of the two "Chinese Dogs" he had for sale, an exorbitant price for that time. It is believed that this high cost was placed on the dogs because the condition was that animals entered in this particular class had to be for sale and the owner did not wish to sell his dogs. The next mention of Chinese Crested Dogs was in 1973, when Mrs Wyn Jackson(Miniatura) from Western Australia imported two Cresteds from England - Ch Staround Yinga and Ch Staround Zorro. Following is the list of Chinese Cresteds imported into Australia up to 2010 as listed with the ANKC. There have also been a number of Cresteds imported from New Zealand, but these dogs originated from Australian Cresteds, the exception being Longshava Lauralei from England. Many Australian breeders have also exported their Chinese Crested Dogs to England, United States, Singapore, Sweden and other countries throughout the world. Australians, in general, have been breeding sound Cresteds that are competitive at the higher levels of the conformation ring. There were a number of Chinese Cresteds that have won Best In Group and Best In Show as well as other In Group and In Show awards in the early years, two of which were Ch Eltarin Sugar N Spice and Ch Talukdar Lily Of The Valley. Special mention should also be made of English import, Ch St Erme Crested Pony, that was awarded Best in Show his first weekend out of quarantine. Another winning crested, Ch Eltarin Lite N Lovely, in the late 80's, took over 200 In Group and In Show awards, including multiple Best In Groups and Best In Shows, before she reached two years of age - an amazing achievement. It is unfortunate that the Grand Champion Award was not available to these grand representatives of the breed(due the title being introduced years later). 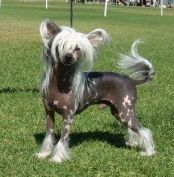 These early Cresteds began a tradition for the Chinese Crested in Australia, with the breed regularly taking the full range of In Group and In Show awards at conformation shows throughout the country. Although it is common in Europe to have dogs that are titled in a number of countries, due to Australia's isolation, multi-champions is something that does not occur often. As more of our Australian Cresteds are exported, here are now a number of Australian bred Chinese Cresteds that are titled in more than one country. One of the most outstanding has been Xioma Sagebrush, an Australian Grand Champion that travelled to New Zealand where he achieved his New Zealand Silver Champion title prior to returning to Australian shores. There are only a few Australian Chinese Cresteds that have achieved the conformation title of Grand Champion. This is a relatively new title, introduced in 1998, where dogs have to attain 1000 points(only 100 points are required for title of Champion). In 2010 the rules for gaining a Grand Champion title in Australia were changed. This title will no longer be a title for an outstanding example of the breed, but for an outstanding example at an all breeds level. A dog will still need to attain 1000 points, but also win at In Group or In Show level. Australia introduced a Supreme Champion, where I dog needs to attain 1000 points, and also win 3 Best in Show or 10 Best in Group awards, with each win under a different judge. With the introduction of this new Supreme Champion title, the Australian Grand Champion rules have reverted to winning 1000 points, the same as pre 2010. As of 1 July 2012, dogs that have been neutered may be shown in a special class at Championship Shows. When the neutered dog has attained 100 points it gains the title of Neutered Champion. Chinese Crested Dogs are becoming popular as therapy dogs. They bond well with their owners and are very aware when something is not quite ‘right’ with their owner. ‘Pandi’ from New South Wales is the first accredited Chinese Crested alert dog for Paws for Diabetics, with the number of Cresteds doing this important work gradually increasing. Chinese Cresteds were first recognised as a breed and shown in Australia in 1973. Only the hairless were recognised at this time, with the powder puff being recognised in 1977 after much campaigning by Aileen Goller(Chmkapow) from Queensland. Breed clubs are gradually developing throughout the states of Australia. Presently there are three Chinese Crested breed clubs in Australia, Chinese Crested Club of NSW(New South Wales), established in 1994; The Chinese Crested Dog Club of Victoria Inc, established in 1991; and The Chinese Crested Dog Club of QLD(Queensland) established in 2006. The clubs in all three states, New South Wales, Victoria and Queensland currently hold speciality shows each year attracting entries of up to approximately 80 per show. Often international speciality judges are invited to judge at these shows. Our breed clubs are involved in rescue, with Rescue Officers prepared to organise pick up, temporary placement and home relocation. Although our clubs are helpful in this area, many rescues in Australia are done privately when breeders become aware of a Crested in need. Responsible breeders in Australia usually expect their Cresteds to be returned to them if for any reason the current owners are unable to keep their dogs, thereby reducing the work for our rescue officers. Currently a number of breeders in Australia are undertaking health testing of their breeding dogs for eyes, hips, shoulders, knees and elbows to reduce the risk of future generations of Chinese Cresteds being with born with these genetic problems. Progressive Retinal Atrophy(PRA) has been identified as a problem that may affect the eyes of Chinese Cresteds. A few years ago there was a DNA marker test developed for one of the forms of PRA, progressive rod-cone degeneration (prcd), which is found in the breed. 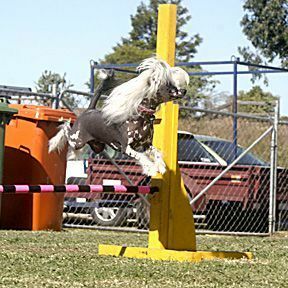 There are a few kennels in Australia that have so far taken the opportunity to carry out this one-off definitive test, and are using it to advantage in their breeding programmes to breed healthier Chinese Crested Dogs. Recently there has also been a DNA marker identified for Primary Lens Luxation, a painful genetic problem, that effects some Chinese Cresteds. In June 2010 this marker was made available in Australia. I have found Chinese Cresteds to be an intelligent and loving breed of dog that I wish to share my life with for many years. My hope is that we will always be thoughtful guardians of these special little dogs. 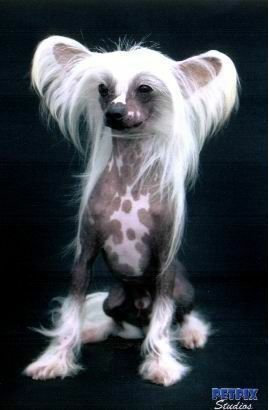 Hopefully the future development of one of the few hairless breeds in the world will not obliterate the unique characteristics of the Chinese Crested in the aim for the 'ideal' show dog.